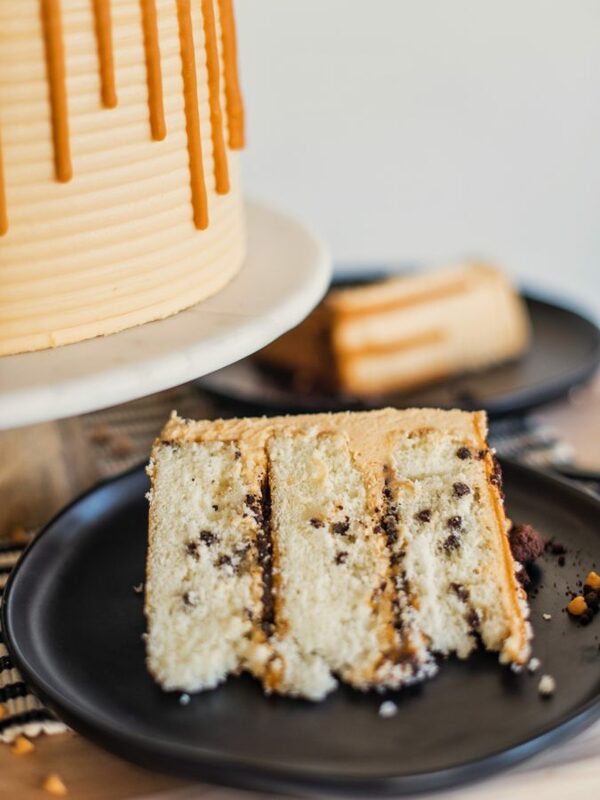 Chocolate Chip Butterscotch Cake – Chocolate chip cake layers with butterscotch frosting, chocolate cookie crumbs and butterscotch ganache. One more cake for you to round out the week. 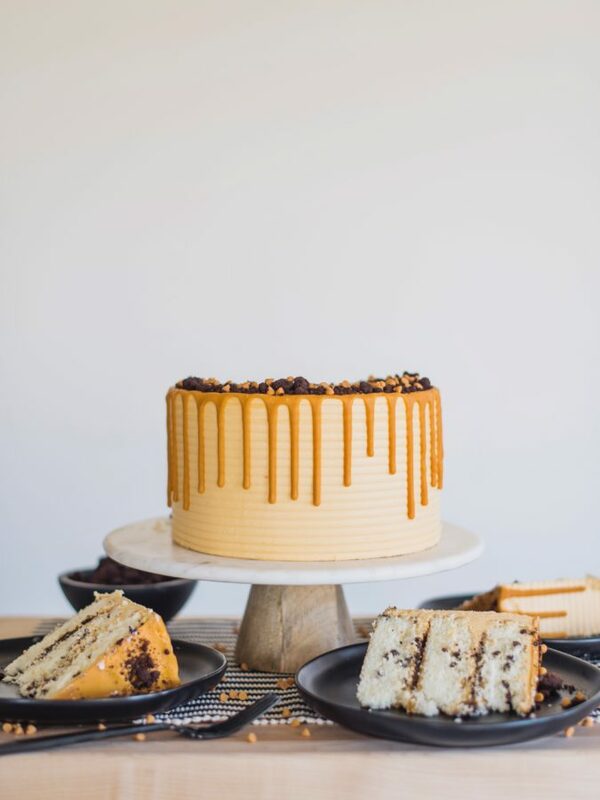 This Chocolate Chip Butterscotch Cake is made with my light and fluffy white cake layers from my Classic White Cake, a new butterscotch frosting, Milk Bar chocolate cookie crumbs and butterscotch ganache. I originally made this cake Milk Bar style, with a butterscotch pudding filling. While I loved the flavors, I always felt like it could be improved. It also never really set well like a Milk Bar style cake should. 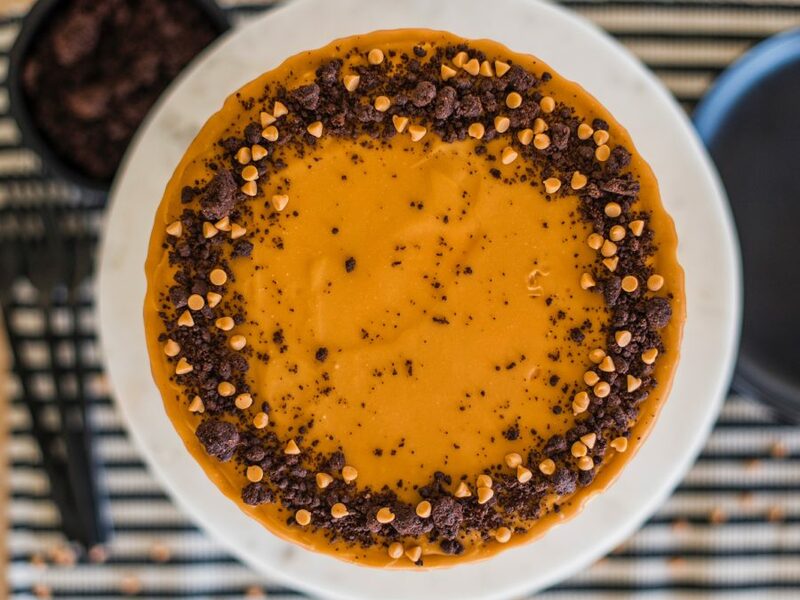 As I thought about remaking this cake, I knew I wanted to switch up the butterscotch pudding. It was always the element of the cake that just didn’t feel right to me. The flavor was great, but it just wasn’t a filling meant for a cake. I decided to completely get rid of the pudding element, and instead, add more butterscotch punch with a butterscotch ganache. You’ll use the ganache in between each layer, as well as on top of the cake as a drip. I also changed my frosting from the original recipe. 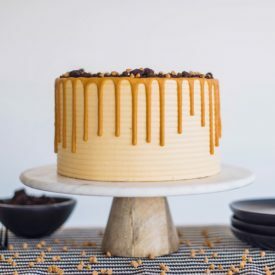 The original recipe had dulce de leche in the frosting and felt more like caramel frosting than butterscotch. My new frosting has melted butterscotch chips in it like my chocolate frosting. I’m so happy with how this revision turned out. The flavors and textures are exactly what I was looking for. 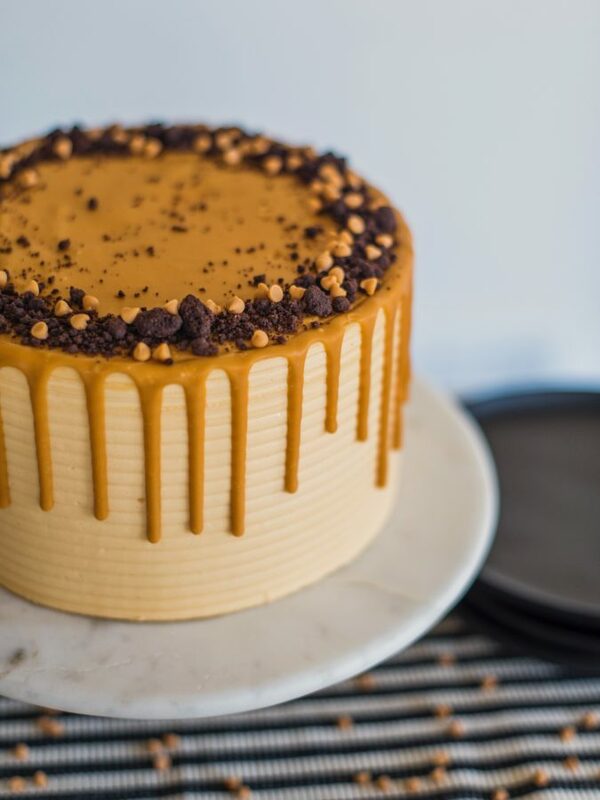 Chocolate chip cake layers with butterscotch frosting, chocolate cookie crumbs and butterscotch ganache. Preheat your oven to 350 degrees. Spray three 8-inch round baking pans with nonstick spray, line the bottom of each pan with parchment paper and spray again. Set aside. Scrape down the sides of bowl and begin to add the egg mixture in 3 separate batches, mixing on medium-low until light and fluffy, about two minutes. Fold once or twice to ensure the batter at the bottom of the bowl is incorporated and mix for another 20 to 30 seconds. Using a kitchen scale, divide batter evenly among your pans (about 16 ounces of batter in each of the 8-inch pans), spreading evenly with a small offset palette knife. Spread the clusters on a parchment lined sheet pan. Bake for 20 minutes, breaking them up occasionally. the crumbs should still be slightly moist to the touch at that point; they will dry and harden as they cool. Let the crumbs cool completely before using in a recipe or eating. stored in an airtight container, they will keep fresh for 1 week at room temperature or 1 month in the fridge or freezer. In a stand mixer fitted with the paddle attachment, beat the butter until creamy, about one minute. Turn the mixer on low and gradually add the melted butterscotch chips. Scrape the sides of the bowl and mix again for another 20 to 30 seconds. With the mixer still on low and gradually add the powdered sugar, followed by the vanilla, salt and heavy cream. Turn the mixer to medium-high and beat the frosting for about 5 minutes. Texture should be light and fluffy. Heat the cream and then pour over the butterscotch chips. Stir until all the chips are melted. 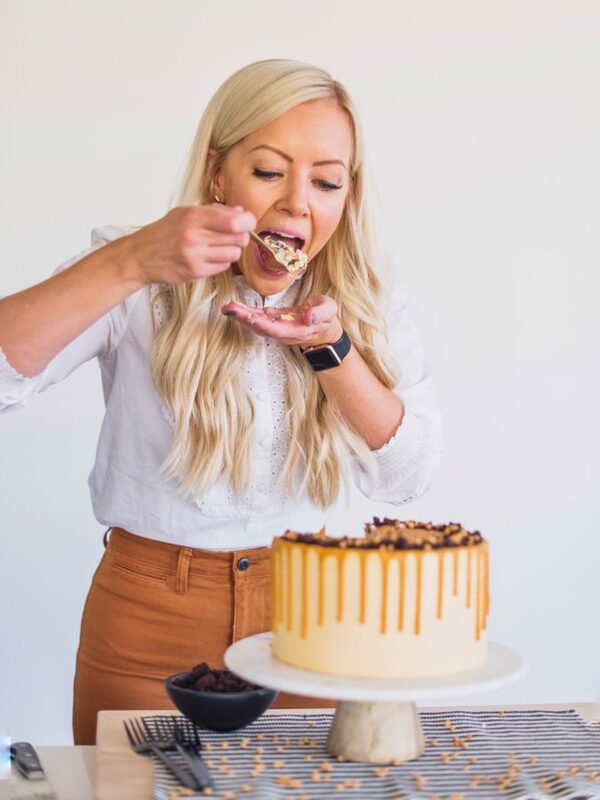 After leveling each cake layer (if needed), place the first cake layer (top side/crumbly side up) on a cake board that has a little frosting on it (which acts like glue to hold the cake in place). 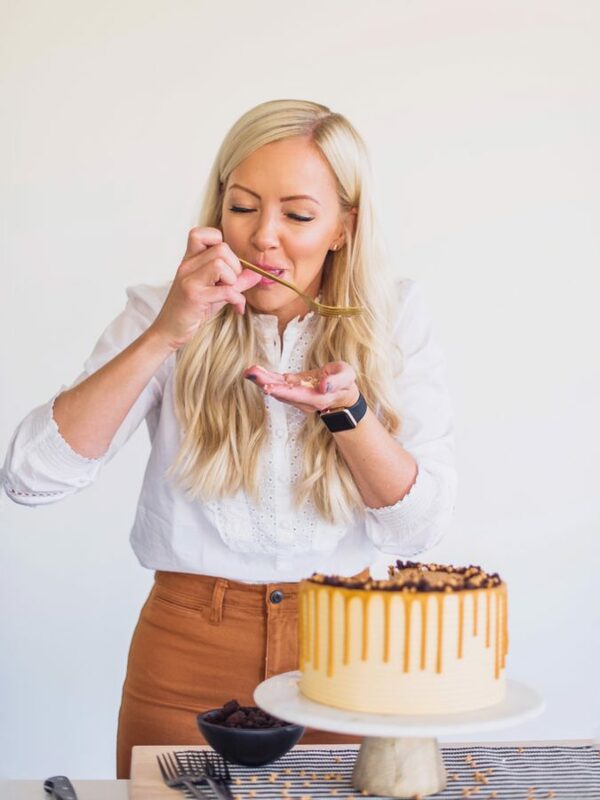 Spread about 1 cup of the frosting over the cake layer.Make sure to get eye level with the cake to check that your frosting is spread evenly across each cake layer. Sprinkle a handful of cookie crumbs over the frosting, followed by a drizzle of the butterscotch ganache. Place the second cake layer on top and repeat step 2 and 3. When you get the final cake layer, place it top side down on the second layer of frosting. Spread a thin coat of frosting around the entire cake to lock in the crumbs. Freeze the cake for 10 minutes to set the crumb coat. Continue to frost and decorate the cake with the remaining frosting. For the cake, try taking out some of the flour – maybe a few tablespoons. I’d also add an extra egg or a 1/4 cup oil. For the butter, just soften it more so it blends better. For the chocolate chips, coat them in a little flour before you fold them in. …One more question! How do you keep the mini chocolate chips from not sinking to the bottom of the cake while it bakes? 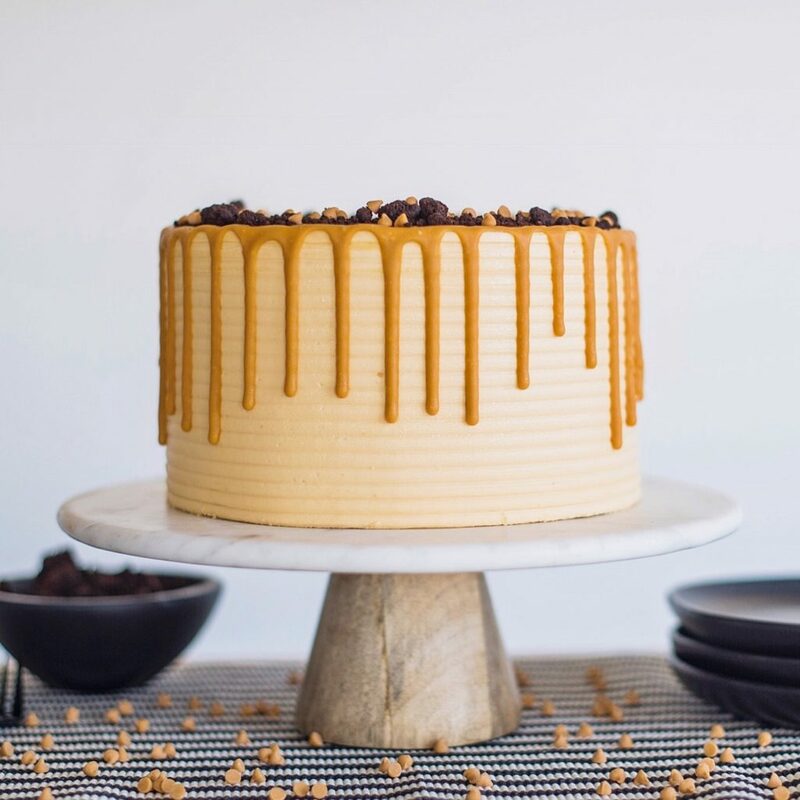 I’m butterscotch obsessed, so I am excited to try this cake out! Thanks Courtney! Hello. Thank you for ur wonderful website. I’m a new baker and have been practicing with some of ur recipes. Ive been making a lot of mistakes but that’s ok because that’s part of the learning process. I don’t know what I’m doing wrong with the buttercream. It’s just enough to cover and frost a layer. I don’t have enough to decorate. Do I have to make more frosting or am I putting too much? I am baking a two layer cake using 9” pan. Thanks again. Hmmm, my recipes are enough to fill and frost an entire cake. I wonder if you’re using too much in the center between the layers and too much for your crumb coat. It should yield about 6 cups of frosting.